A top design cutting pliers made of precision stainless steel used to cut a variety of screws. The top cutting design allows the tool to trim screws very close to the lens, as is the case with drill mount rimless frames. 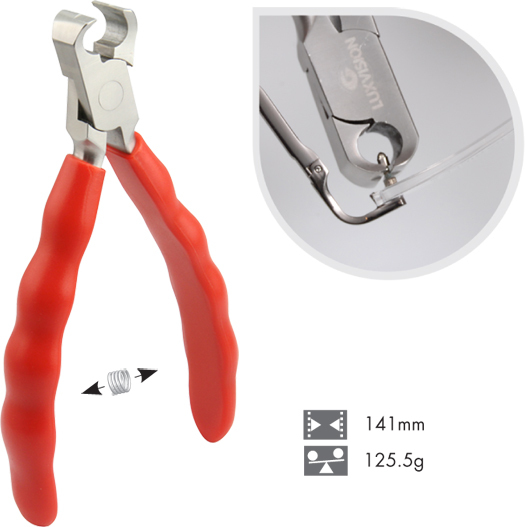 The pliers are very effective for cutting temple core wires and is useful in a number of cutting tasks. Front Cutter Pliers. Stainless Steel Chappel style cutting pliers for trimming screws and shortening temple core wires. Precision made cutting jaws assure a smooth even cut. Padded handles insure comfort and control when in use.